We have a number of gorgeous weddings books for you to take a look at when you visit our studio. 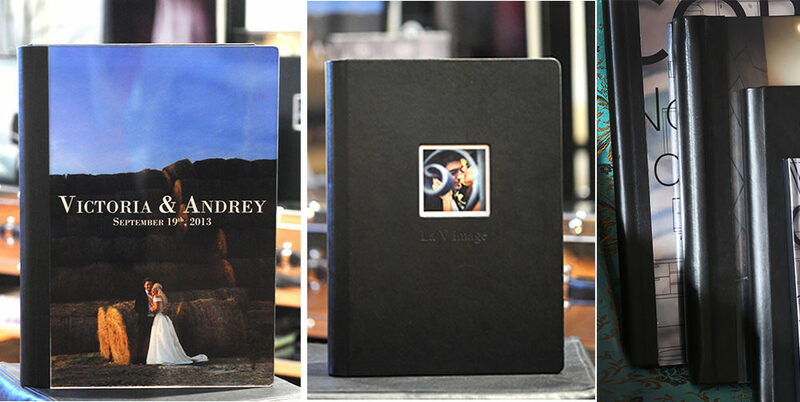 Our couples receive a custom “La V image” Signature Wedding album. Every page is individually designed to make your album personal and unique. The album is assembled with love and care in order to tell the beautiful story of your wedding day through many generations to come.It’s very important for the wedding book to be one of the main attraction of your house. Each picture in the book is carefully retouched to make it look like a piece of fine art. We also have a great selection of parents albums and cute mini books. Our most popular wedding album is a glamorous Story Book produced in Italy. The usual number of pages is 40. That means 20 sheets (or spreads), 40 pages. You can add more pages by the pair. Step 1: Select all your favourite pictures. You can make to folders: “Must have” and ” Like”. Try to keep around 50 image in each folder. Step 2: We will design your wedding album layout and send for your approval. Step 3: You have three sets of changes to make. We go back and forward until you are completely happy with your wedding album. Step 4: We individually retouch all the images in the album. Step 5: Send to print. It takes about 8-10 weeks to craft the Story book.